It might not seem like engineering and horticulture have much in common. 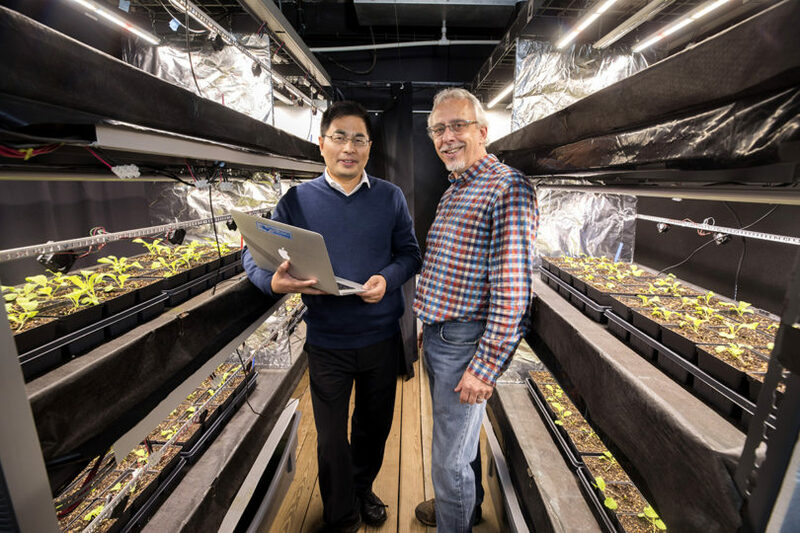 But WenZhan Song and Marc van Iersel are finding new ways to intertwine their respective fields thanks to UGA’s Presidential Interdisciplinary Seed Grant Program. 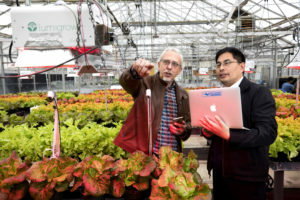 Song and van Iersel’s project, “Smart cyber-physical systems for controlled-environment agriculture,” lies at the intersection of food security, energy and environmental sustainability, and includes additional faculty in the College of Engineering, Franklin College of Arts and Sciences and Terry College of Business. The grant allowed the researchers to purchase and install sensors within a greenhouse to collect environmental and crop health data. The findings could have implications for improving food safety and for growing plants in space, as part of disaster relief efforts and for military applications. The team subsequently has received a grant from the USDA for $5 million over four years and has a pending proposal with the NSF to continue this line of research. “Sometimes you have different languages, and sometimes you have different interests, but it’s about everyone stepping forward to find common ground,” said Song, Georgia Power Mickey A. Brown Professor in the College of Engineering. The 11 other faculty teams that received Interdisciplinary Seed Grant awards last year also are working to find that common ground and expand their research. Their projects were selected from more than 150 research proposals. The university’s investment of $1.37 million in the program has generated $12.9 million in awarded grants, with the potential for more in the future. The Interdisciplinary Seed Grant Program represents a strategic investment by the University of Georgia in its faculty and the research enterprise. Interdisciplinary Seed Grant proposals were reviewed by a team of UGA faculty and administrators assembled by Lee and Jennifer Frum, vice president for public service and outreach. The review team selected winning proposals based on demonstrated potential to address grand challenges and to generate new external funding in the future. Inclusion of public service and outreach components also was considered, among other criteria. For all of the recipients, these grants are providing new opportunities. evidence-based reintegration programming for female victims of human trafficking in West Africa. They aim to develop a theoretical model of the factors that facilitate successful reintegration and create an intervention manual based on that model. To do this, they are collecting data from human trafficking survivors, health and social service providers, and governmental policy leaders. The ultimate goal is to craft intervention and reintegration programs that are responsive to the needs of survivors. The formative work from their Interdisciplinary Seed Grant led to a five-year award by the U.S. Department of State’s Office to Combat and Monitor Trafficking in Persons and is part of its Program to End Modern Slavery. The new award to the university was recently mentioned at the 2018 United Nations General Assembly, helping to position UGA as a leader in the field. The State Department award will expand the work by Okech and his research team to Sierra Leone and Guinea in West Africa. Carolyn Lauckner, an assistant professor of health promotion and behavior in the College of Public Health, is working with Bernadette Heckman, associate professor and director of clinical training in the Doctoral Counseling Psychology program and Health Psychology program in the College of Education, on a project using telemedicine to meet the mental health needs of people living with HIV/AIDS in rural Georgia. They are working with the Georgia Department of Public Health’s existing statewide telemedicine network to pilot the expansion of mental health services using innovative videoconferencing technologies, allowing patients with limited access or transportation to receive care at no charge. The project also provides a unique experiential learning opportunity for Heckman’s students, who are providing therapy. Heckman meets weekly with the students to discuss suggested therapies for the patients, and the students have presented their work at a conference. Lauckner and Heckman are collaborating on a paper and plan to submit another grant proposal related to their work soon. Mark Tompkins, a professor of infectious diseases in the College of Veterinary Medicine, is studying how microbiomes, or the microorganisms in a particular environment, affect respiratory infection, disease and transmission with researchers from the Odum School of Ecology and College of Public Health. The researchers hope to develop mathematical models that could lead to more effective vaccines and are working to expand this research into new grant opportunities.